Window film is not only used for functional purposes, such as preventing UV rays from passing through your windows, they are also there to jazz up your home or office. You’d be surprised how a little tint, color or texture can make a world of a difference to a building, and therefore some specialty window films are used solely for aesthetic purposes! You can tint glass stairwell panels, or even glass treads themselves! Add some color and texture to your glass staircase for a professional and sleek finish. This can be used in an office or even at home. If the treads are made of glass, adding some texture can also liven up the whole staircase. Many offices that have glass treads often have textured strips on the end of the treads for a sophisticated finish. However, if the panels and treads are both made of glass, choose one or the other to add texture, but not both, as it can be overdone. Many homes and offices have internal glass walls to separate rooms or office cubicles. Almost all of them will have some kind of window film to keep out the sun’s rays, especially if the rooms are open plan, or if the building lets a lot of light in through glass walls or windows. Tinting these internal glass walls will not only help keep the glare and heat out, but it can also give a lovely finish to the interior of the building. 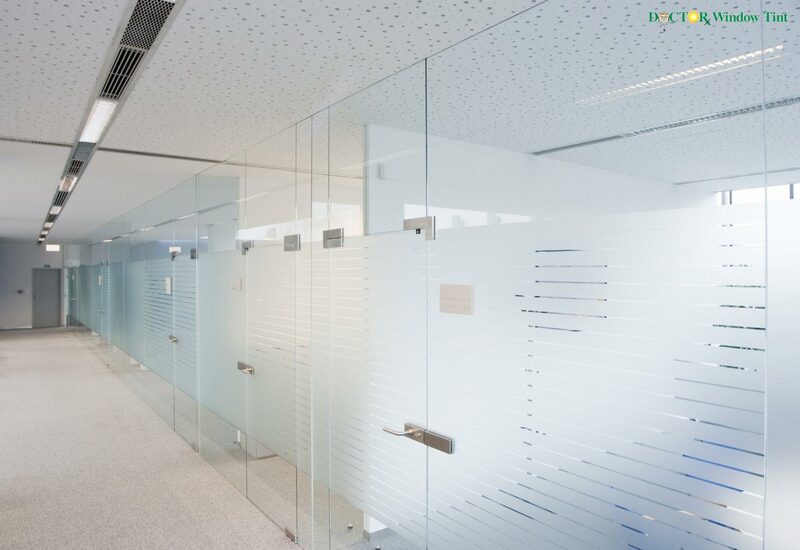 The white opaque tint mentioned earlier is often used for internal glass walls. We all naturally think that a window film is needed to keep out the sun’s glare and UV ray damage, but we forget that we can choose different colors! You can spice up your windows by adding some color and/or texture of any kind to decorate your house or room. A little tint and texture may sound subtle, but it can make a huge impact on the aesthetics of your home. Decorative window tints that contain an assortment of colors can create a lovely mosaic piece of art. It is a beautiful thing to see light that bounces through different hues in a mosaic tinted window, and it creates a bubbly and vibrant atmosphere! Adding film to window panels on the door frames will reduce the amount of light and UV damage that can shine through, while also creating some personality for your door. Texturing the panels also gives you some privacy, as it will make it difficult to see through. To give you some bathroom privacy, add some tint or texture to your shower panels. This is where the white opaque tint comes in, and it also gives the shower a clean and fresh finish, enhancing the general atmosphere of the bathroom. Some office cubical are either entirely made of glass, or they have glass windows on the top the cubical walls, these window on top can also be tinted or textured to enhance the look of the office, making it look more professional. Adding texture can create more privacy for each cubical, while allowing enough light in to create a well-lit and pleasing atmosphere. Now that you have some ideas on window film use, contact Doctor Window Tint! We supply decorative or specialty window film to decorate any glass or Perspex anywhere, be it interior or exterior. There is a wide variety of window tints and textures for you to choose from. You can add a little flare to any glass or Perspex window, room, wall or door!